SAN GABRIEL, California, November 19, 2017 — Colleen and I love Italian food. Her mother’s family hails from Sicily, and, as for me, I get into the club because my dad whipped up a killer spaghetti sauce at least once a week. Given our heritage, there isn’t an Italian pasta we don’t like. Spaghetti, Fusilli, Rigatoni, Fettucini, Linguini, Penne, Ziti, Cannelloni, Farfalle, Tortellini, Gnocchi, Lasagne, and Pasta e Fagioli, have all been consistent staples at our dinner table. But in the San Gabriel Valley — which is home to the Asian-dominant communities of Monterey Park, Walnut, Rowland Heights, Diamond Bar, San Gabriel, San Marino Arcadia, Temple City, Rosemead, and Alhambra — the carbohydrate of choice is no longer a pasta, but a noodle. 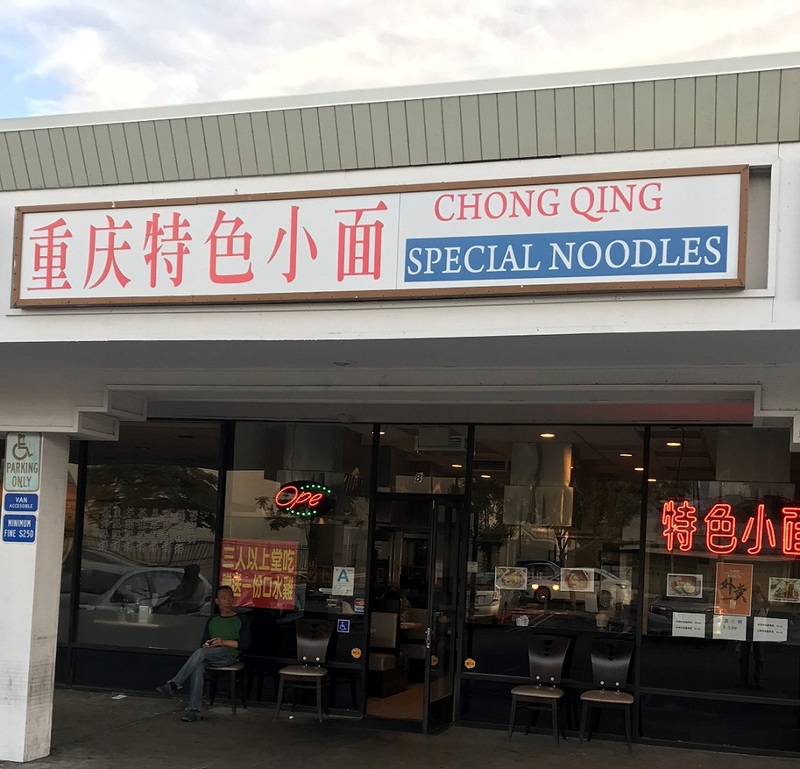 So in an attempt to bust out of our Italian bubble, at least for a few hours, I suggested for our Sunday Drive we take a quick spin to Chongqing Special Noodles (708 E. Las Tunas Dr.) in San Gabriel. I wanted to eat in an authentic joint where I was rubbing shoulders with the nabobs of noodle-ism. 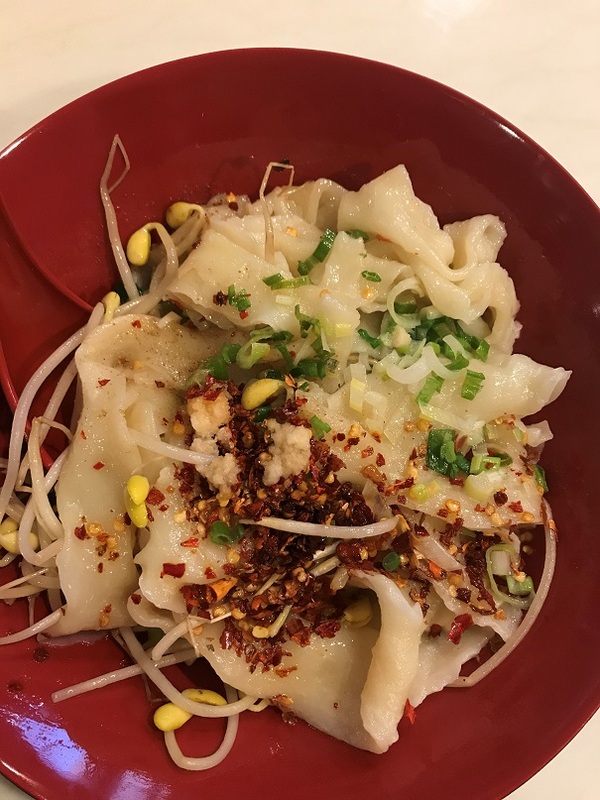 Chongqing Special Noodles takes its name from the city of Chongqing, an area in southwest China with a landscape similar to our Appalachians that is home to 30 million people who have a burning obsession for hot chiles. Hard to believe, I wanted more heat. When I pulled into the parking lot, I gritted my teeth a bit, but tried not to let my disappointment over the area show. 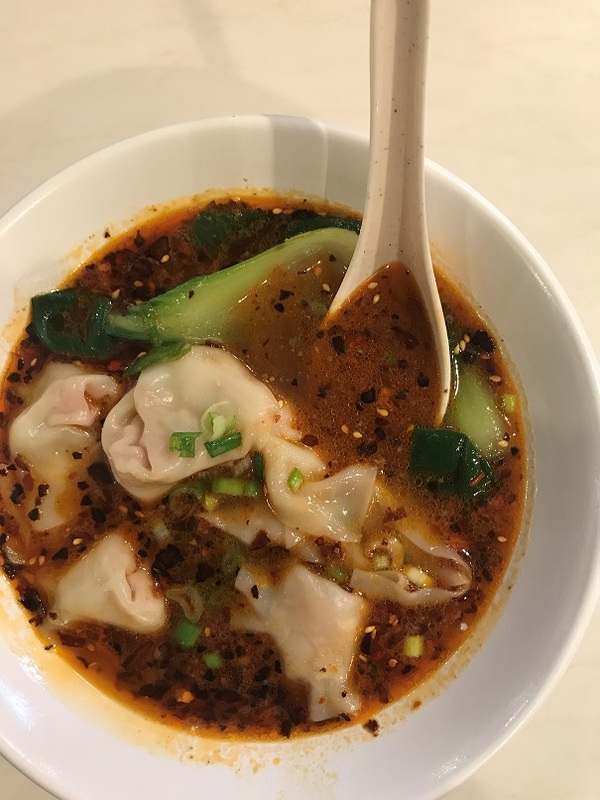 Chongqing Special Noodles is located in a crummy strip mall, where you would normally find laundromats, nail salons and doughnuts shop. But this strip mall is a virtual restaurant row with a bakery, Chinese restaurant and Japanese restaurant all crowded together. But we came for the noodles. Without really understanding the menu or the very nice lady serving us, I rolled the dice and ordered the No. 22, a handmade noodle dish. When they arrived, the noodles were wider and longer than a tape measure, and I’m a guy who snaps his spaghetti in half before dumping it into boiling water. Still, I enjoyed wrestling with chewiness of the noodles, but surprisingly, I thought they were under-seasoned. Colleen’s won ton, one of the few dishes we recognized from the menu, was far better. To tell the truth, I had never seen a bowl so crowded with won ton. The peppery broth was delicious, and it tasted like it was full of healing herbs. Our bill, which included a can of Coke, came to $17.20, before the tip. In my first foray into the Chongqing noodle world, I felt a little out of my league, but I will soon venture back into the San Gabriel sea of noodle shops, believing that you can’t judge a new dining experience by one immersion — and, after all, the flavors were intriguing. When in Rome, do as the Romans do, but when in the San Gabriel Valley, well, eat noodles. 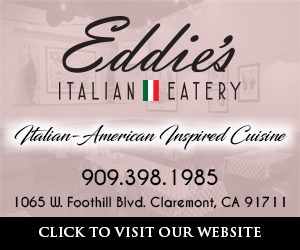 Tell us about some of your favorite dining experiences in the San Gabriel Valley. We’ll post your review right here on La Verne Online.